1 “Cyber Dragon” monster + 1+ monsters in the Extra Monster Zone Cannot be used as Fusion Material. Must first be Special Summoned (from your Extra Deck) by sending the above cards from either field to the GY. (You do not use “Polymerization”.) The original ATK of this card becomes 1200 x the number of Fusion Materials used for its Special Summon. Another Fusion for Cyber Dragons in their new deck. Chimeratech Megafleet Dragon. Cyber Dragon need alongside one or more monsters in the Extra Monster Zone. Like previous Cyber Dragon Fusion monsters that have similar effects, you can use your opponents monsters for this Fusion Summon. Field elimination without destruction is fantastic, especially when it only costs you a Cyber Dragon. 1200ATK boost times the number of materials used for the summon should get you at least a 2400ATK Chimeratech Megafleet Dragon. Not restrictive to Machine-Type monsters like in the past, this Fusion alongside Cyber Dragon could find itself into Side Decks moving forward. If someone Pendulum Summons a ton of monsters and keeps their monster zones stocked, you can wipe away their field and potentially game them with your newest monster. I love how this monster doesn’t require it to be in your Extra Monster Zone to gain its effect(s) and that its reach covers 10 of 12 Monster Zones on the field. Advanced-3/5- Solid field-clearing potential for little investment. Side Deck option in the future perhaps. Oh do we like this. Chimeratech Megafleet Dragon is a Level 10 Dark Machine-type Fusion Monster with 0 Atk and 0 Def. The stats start badly, but depending on the number of materials used for its Special Summon, the original Atk will be 1200 multiplied by that number. Sadly the Def will always be 0 and it can’t be used as Fusion Material. Gladly, this monster turns any Cyber Dragon monster into an Extra Monster Zone remover. If Chimeratech Megafleet Dragon is in the Extra Deck, you can remove the required materials from either side of the field for its Special Summon. And those materials are easy. I really want to use Toon Cyber Dragon for the extra laughs. Plus, even though it’s not a Fusion Summon, it is considered to be Summoned properly. This can clear a field while never having to exist in the Main Deck and then have 2400 or more Atk. Future potential is really high. Once deck down, two more to go. We are back to looking at cards from the Legendary Dragon Decks and this week will focus on the Cyber Dragon deck. Similar to last week, we will begin the week with the new card in the deck, Chimeratech Megafleet Dragon. Megafleet is a Fusion, just like most of the Cyber Dragon cards in the Extra Deck with base stats of 0/0, which is noteworthy if the effect is negated via Skill Drain or something. Megafleet requires a Cyber Dragon monster and at least one monster in the Extra Monster Zone. Very specific for where the card has to be, but Extra Deck monsters have to be summoned there, and this can be very powerful if it said monsters from the Extra Deck. All Megafleet really does is gain 1200 ATK per material. Hey, it outs the Extra Link. 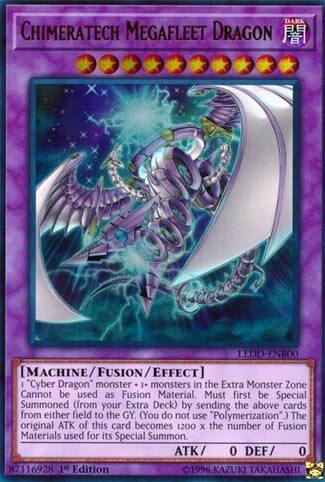 If your opponent has a Cyber Dragon Infinity as well as cards in the Extra Monster Zone, you can fuse using their monsters. Yes, this doesn’t specifically require Cyber Dragon, which is new to us. Kaijus does what this card does, to be honest, but it is a worthwhile edition to the Cyber Dragon deck. Plus, you never know what the banlist could do to Kaijus. Megafleet? What exactly makes a fleet mega? But I suppose that’s neither here nor there. CMD is a Level 10, Dark, Machine, Fusion Monster, who starts out with 0 attack and defense, at least for base stats. Level 10 is fun, it gives it abilities for you to use to become something else potentially too. CMD is Fusion Summoned with 1 Cyber Dragon Monster (not Cyber Dragon per say, just a Cyber Dragon Monster) and 1 (or more) Monster in the Extra Monster Zone. You can use Monsters from either side of the Field too, which is a useful ability. Not needing Poly is a plus, and this guy can get strong, and fast. 1200 attack per Material is nothing to scoff at. That’s about as far as the effect goes. It can’t be used itself as Fusion Material, which honestly isn’t a big deal either. It’s fun, can be huge, and looks awesome.